If your child loves games and puzzles, this printable kids Valentine’s Day card will be perfect. 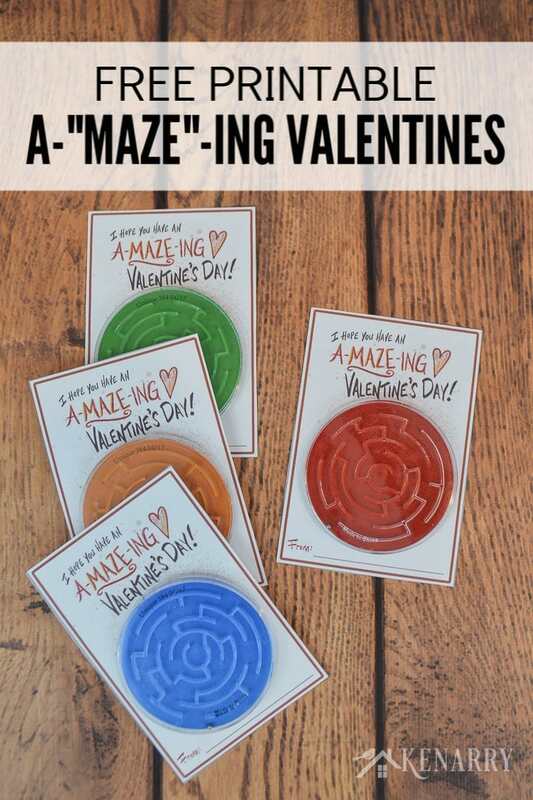 Just download the free printable and attach a toy maze or labyrinth. Does your son or daughter get super excited about puzzles, games and mazes? 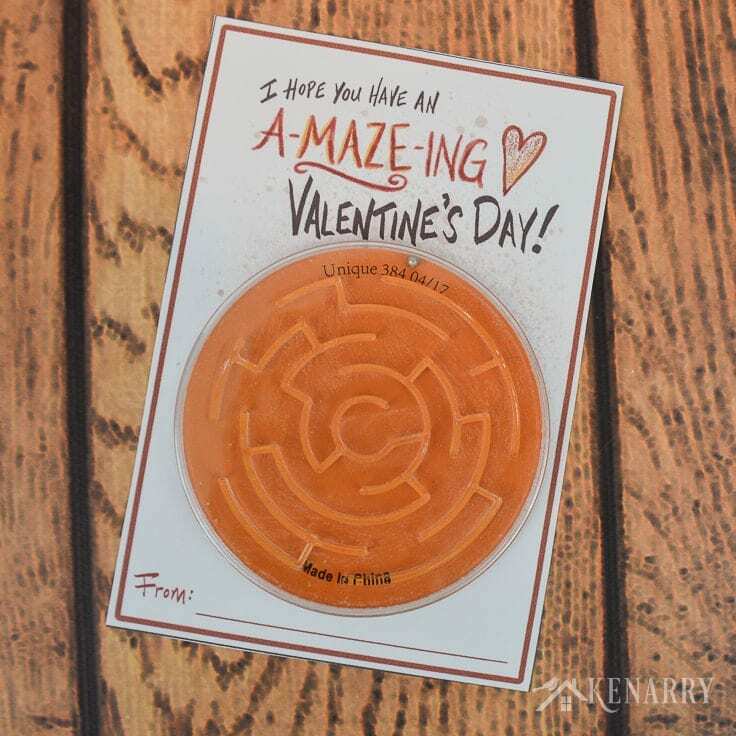 With Valentine’s Day coming up soon, he or she will get a big kick out of the “A-Maze-ing” Kids Valentine’s Day Card we’re sharing today. 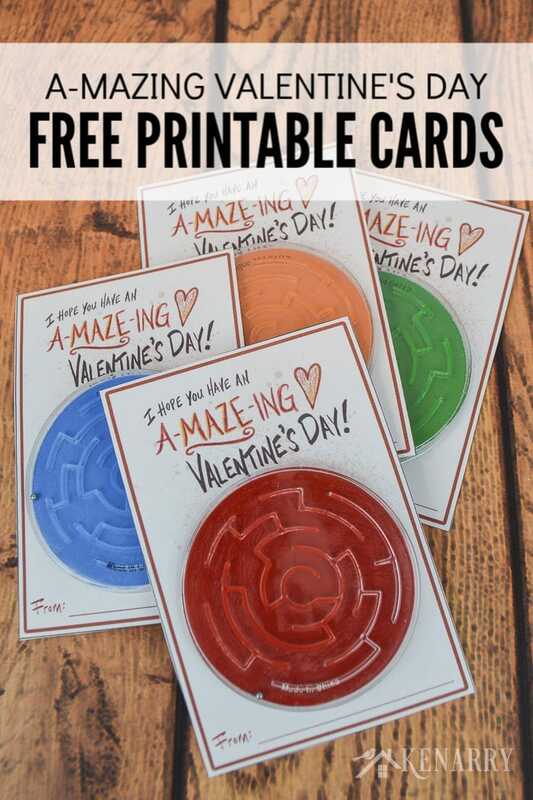 You can use these free printable Valentine’s Day cards as is but they’re even better when you pair them with a small toy maze or labyrinth. Each year, we design a unique kids Valentine’s Day card for our oldest son to give to his friends at school. 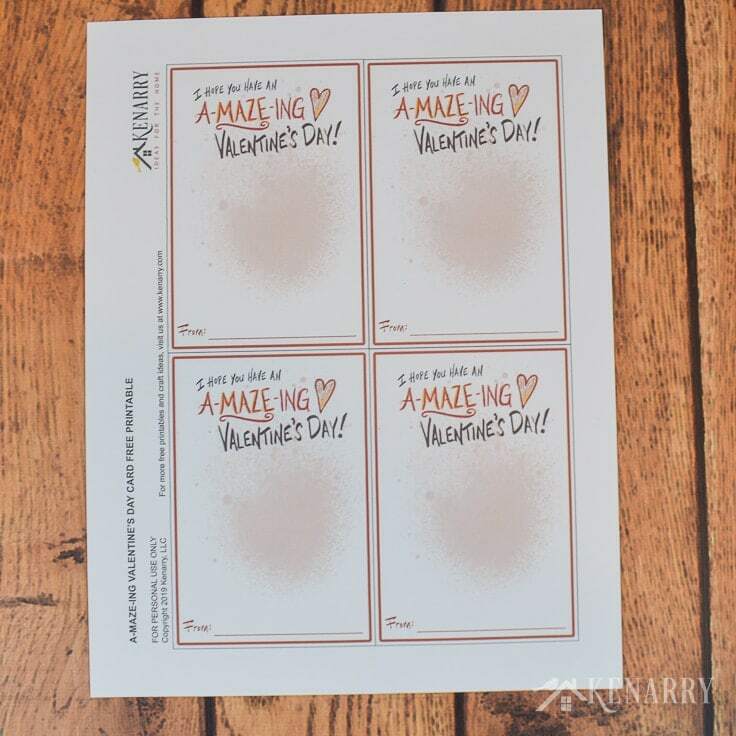 Most often, we create Valentine’s Day cards that can be attached to a low cost treat or trinket. For preschool several years ago, we made cute Fish Valentines that attached to a bag of goldfish crackers. Then for his kindergarten class, we were inspired to make Ruler Valentines after finding inexpensive, colorful rulers at our dollar store! When he was in first grade, he was really into telling jokes, so we made valentines with a funny car joke and attached Laffy Taffy candy! So then for his kids Valentine’s Day card for second grade we went back to our dollar store in search of the perfect low cost toy or treat. 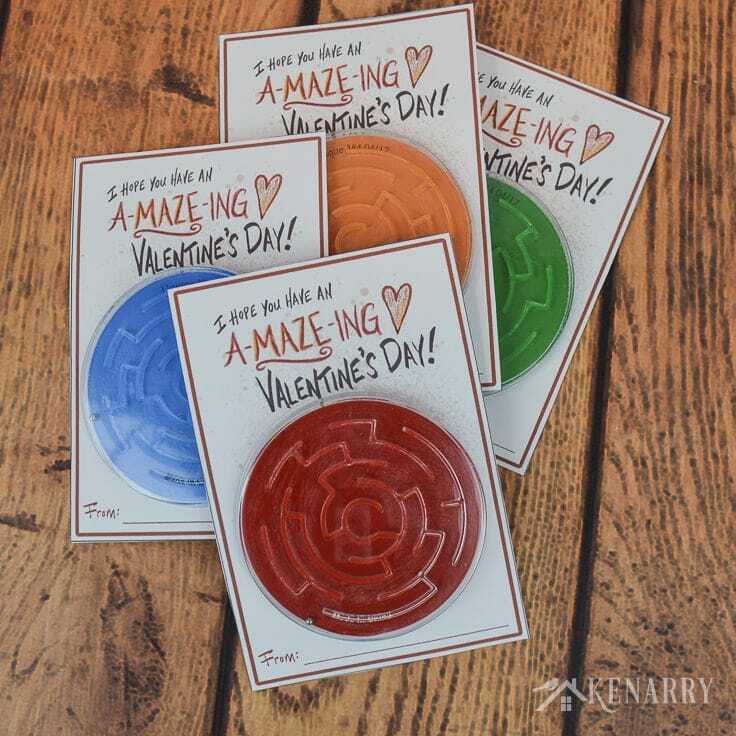 We thought your preschool or elementary child might love these “a-MAZE-ing” cards too so we’ve made the kids Valentine’s Day card available as a FREE digital download for Kenarry Idea Insiders. 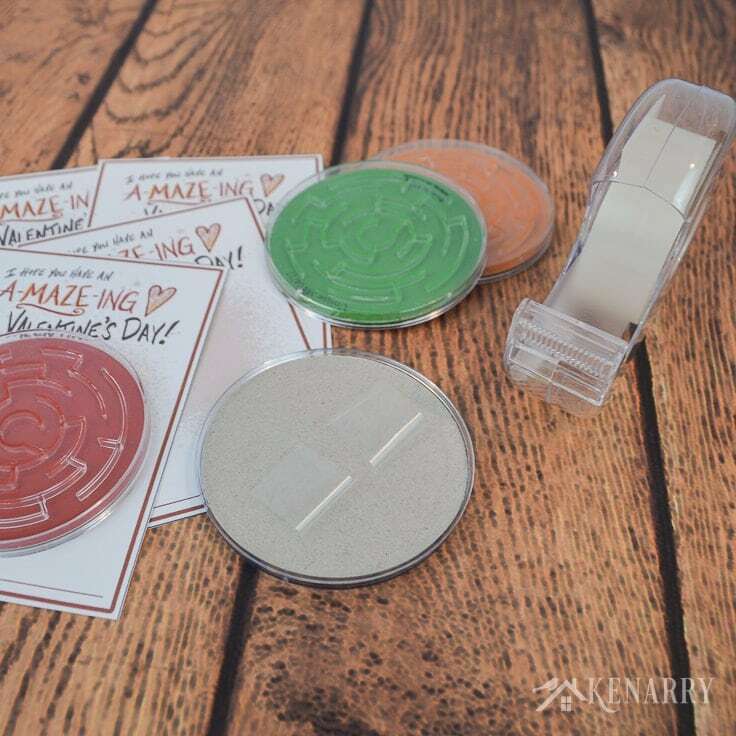 To make these a-MAZE-ing Valentine’s Day Cards, all you need are few simple things! 1. Get the free printable kids Valentine’s Day Card. The printable kids Valentine’s Day card is available as a FREE gift when you sign up below! Then you just need to download the PDF file and save it to your computer. This kids Valentine’s Day card and all other free printables from Ideas for the Home by Kenarry™ are for your own PERSONAL USE ONLY. 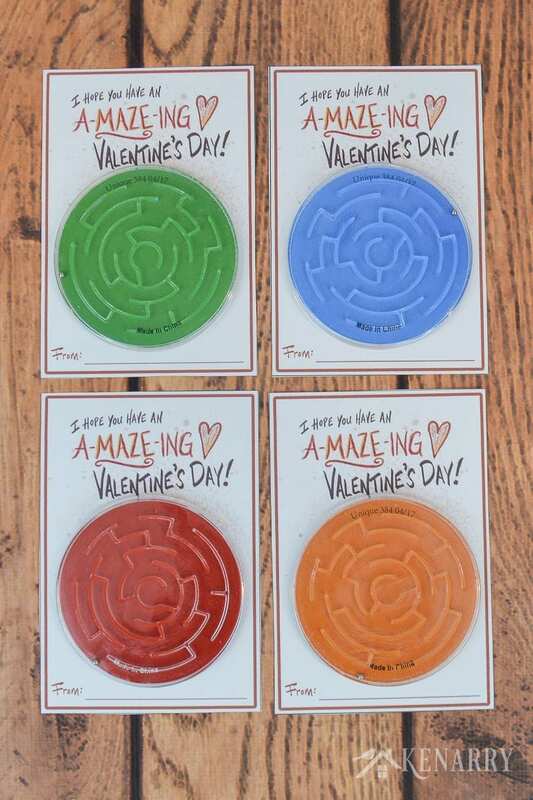 Once you have the file, print the tags for the Maze Valentines on white card stock. 2. 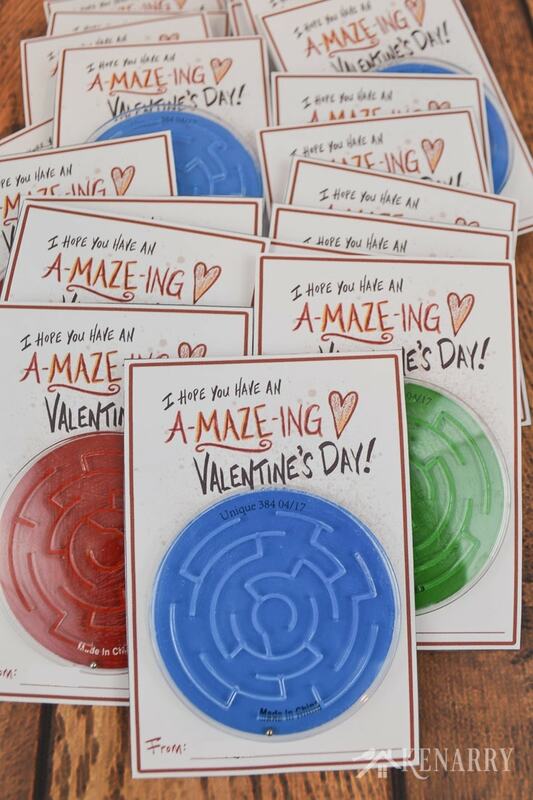 Cut apart the A-MAZE-ing Valentines. 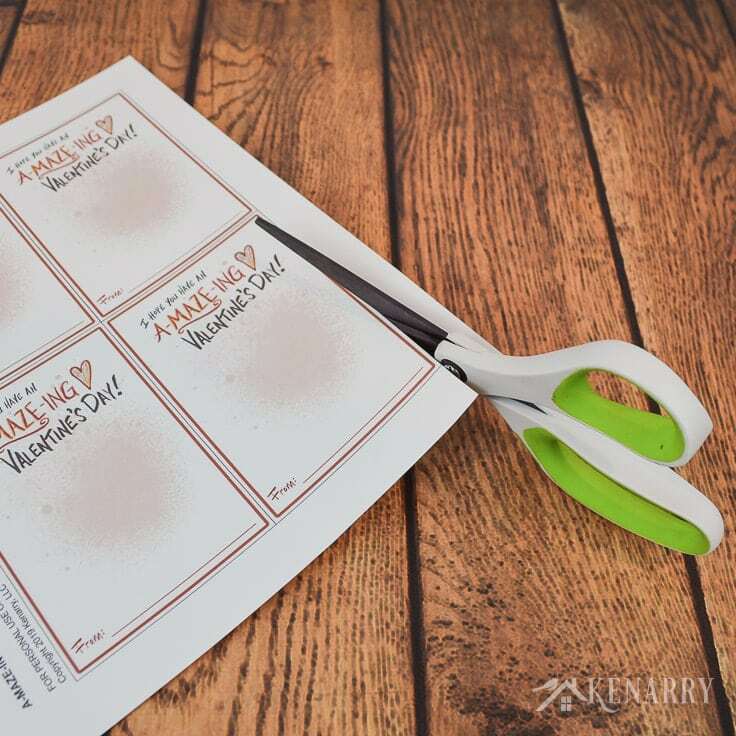 Use scissors or a paper trimmer to cut apart each kids Valentine’s Day card along the gray lines. 3. Have your child sign the Valentine cards. 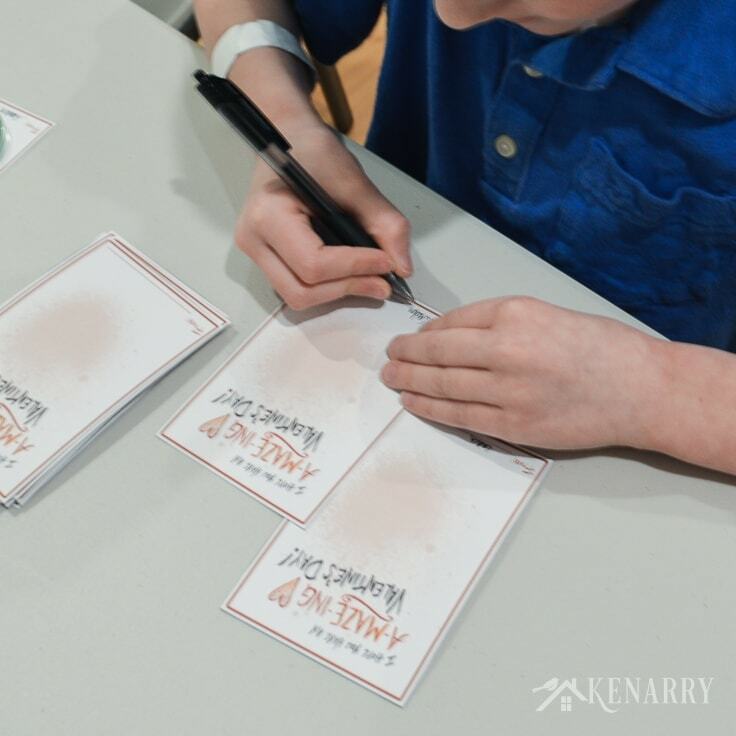 If your child is able to write, have your child put his or her name on each Valentine’s Day card. Check with your child’s teacher to see if he or she has a preference for whether your child should also address the cards to specific friends in class. Some teachers feel that the whole distribution process at the Valentine’s Day party is easier when the cards aren’t addressed to a specific child. This way students can give any valentine card to any kid. 4. 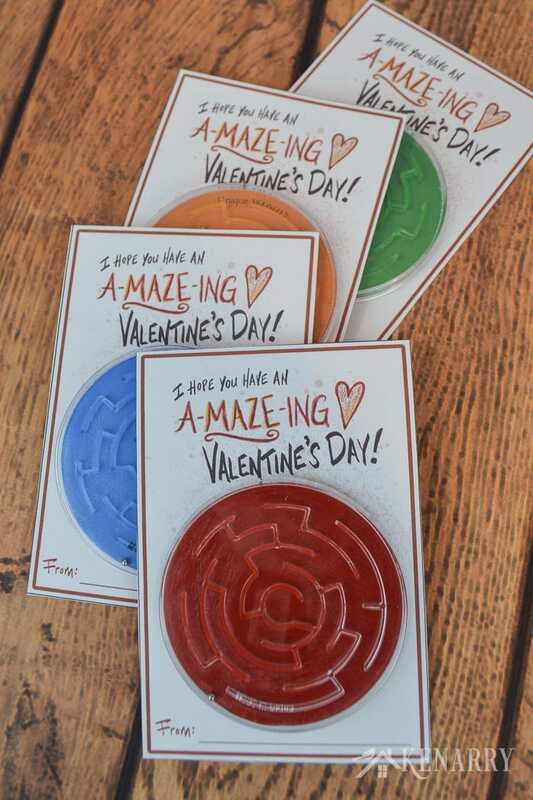 Attach the mazes to the cards. 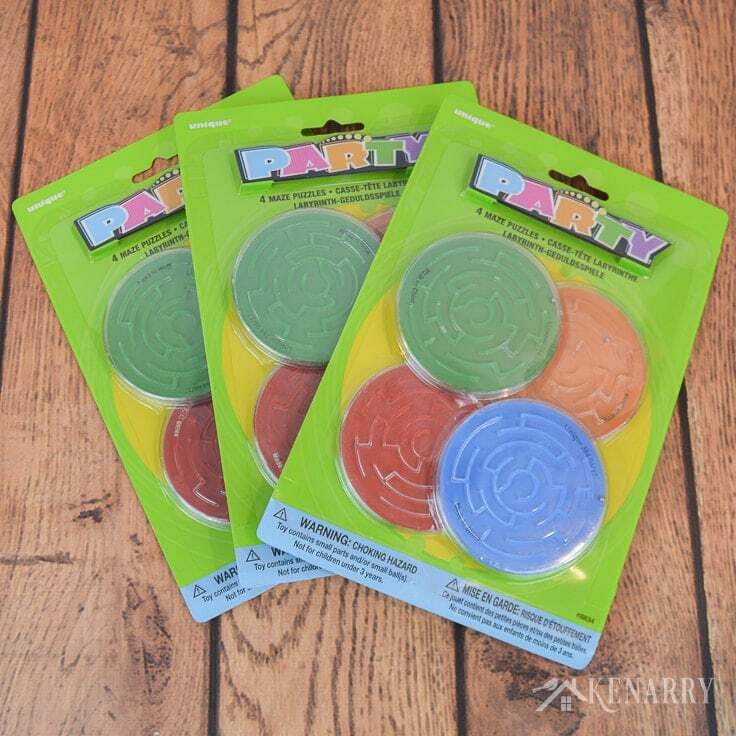 Make a couple of loops with pieces of transparent tape and stick it to the back of the toy maze. 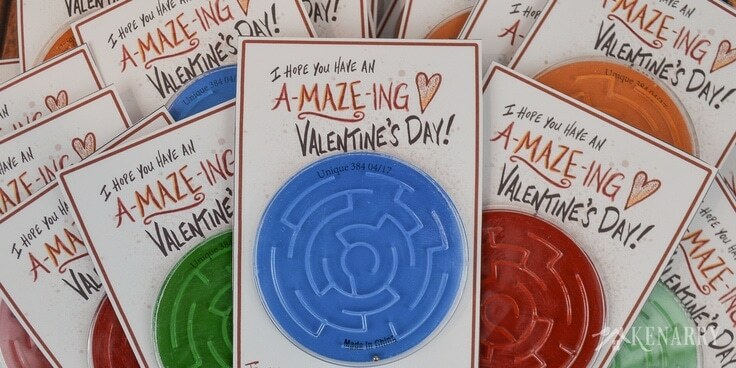 Then carefully, but firmly press the maze on the front of the Valentine’s Day card. If you don’t have any transparent tape, a dollop of all purpose glue would work to hold the mazes on too. 5. Finish the remaining Valentine’s Day cards for kids. Repeat these steps until you’ve made as many Valentine’s Day cards as you need for your child’s classmates. We hope you enjoy this colorful and fun free printable Valentine’s Day card for your child to give to friends at school! What kind of valentines have your children given to their friends? Have you seen any clever ones? Please comment below and share. 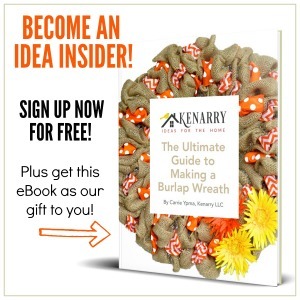 We’re always looking for new ideas.